It was on this day in the year 553 A.D. that Emperor Justinian of the Byzantine Empire issued an order that provided for the public reading of the Greek translation of the biblical portion, or the Torah portion, that was being read in Jewish synagogues each Sabbath. This decision acknowledged the benefit of everyone that read the Scripture would literally be on the same page. Where Israel is concerned, the Torah portion cycle ensures that the entire nation is reading the same text and perhaps seeing the same things within the text. 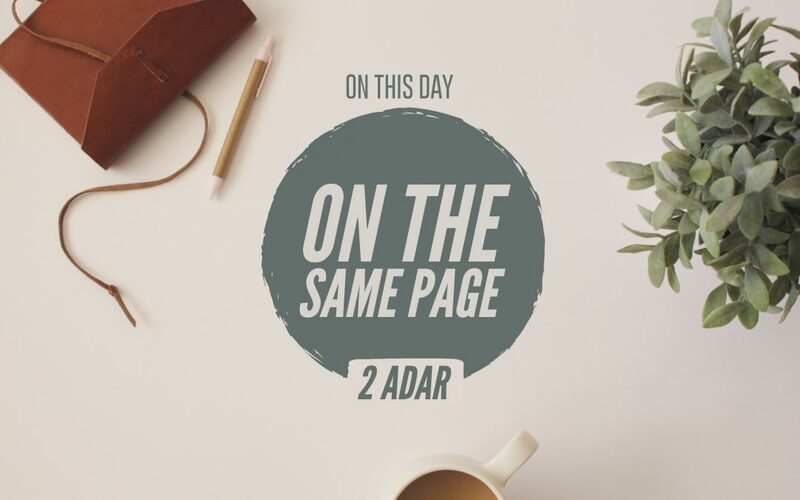 Not only that but there have been times that readers could easily see a connection between themes within that particular week’s Torah portion and events that were happening in the world. While there is no commandment for everyone to read the same thing, there is something to be said for being in one accord and united. Regardless of the issue, there is great benefit to the Body and to the world when His people come together as one. As we see in Acts 2, when His people are on the same page, exciting things happen. “When the Day of Pentecost had fully come, they were all with one accord in one place. And suddenly there came a sound from heaven, as of a rushing mighty wind, and it filled the whole house where they were sitting. Then there appeared to them divided tongues, as of fire, and one sat upon each of them. And they were all filled with the Holy Spirit and began to speak with other tongues, as the Spirit gave them utterance.” (Acts 2:1-4). Rather than focusing so much on the spiritual demonstration, let’s look at the environment that the Spirit of God came into. God moved upon them when they were in one place and when they were in one accord inferring that this would not have happened otherwise. In other words, division, strife and disfunction impedes the move of God among His people. If all the parts of the Body are drifting away from each other, or are moving against one another in conflict, the Body can’t function in the way God intended it to. In John 17, Messiah prayed that we would be one, “So that the world may believe that You sent Me” (Jn. 17:21). That strongly suggests that as long as we choose to divide over different issues and focus on all the wrong things, what God has determined to do among His people and through His people might be delayed. Those assembled in Acts 2 were not to leave Jerusalem until they had been empowered from on high. That meant that, until they were filled with the Holy Spirit, they could not fulfill the commission given them by Messiah – that is, to be His witnesses. Behold, how good and how pleasant it is for brethren to dwell together in unity! It is like the precious oil upon the head, running down on the beard, the beard of Aaron, running down on the edge of his garments. It is like the dew of Hermon, descending upon the mountains of Zion; for there the Lord commanded the blessing— life forevermore (Psalm 133). There are many lives at stake; many are waiting for that encounter with you or, more importantly, the Spirit of God within you. Though they may not realize it, a desperate world is waiting to encounter a Body that is empowered by the Spirit of the Living God. But if they are to believe that the Father has sent the Son and see their lives transformed by His Spirit, we must, as the Messiah prayed, be one. Dwelling together in unity is the key to a Heavenly visitation and it is the evidence of the Spirit of God in our lives that will impact the lives of others.